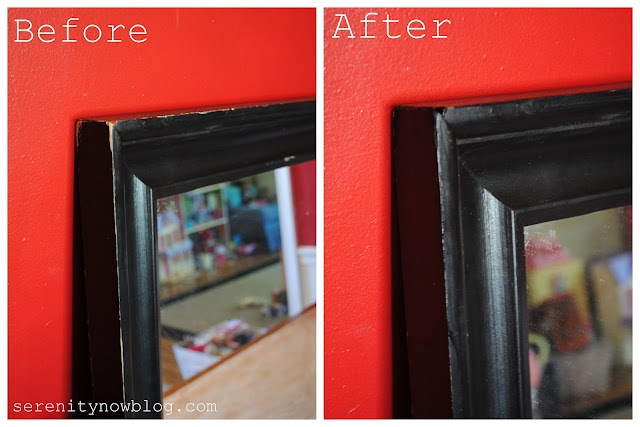 Wanna see how I used some Q-tips® PrecisionTips™ to give a thrift store mirror some rehab work? 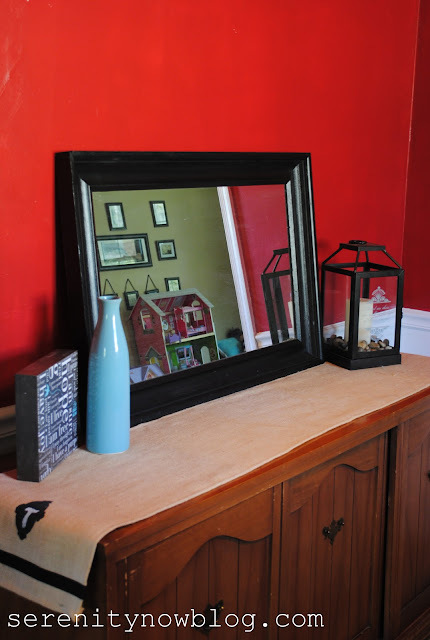 I recently scored an IKEA Hemnes mirror at a local consignment shop. My friend Christy and I love to go on thrifting jaunts on the days all of our kiddos are in school/preschool. IKEA usually retails the smaller Hemnes mirror for $44.99, and I got mine for just $20! The only drawback was that it had some major "distressing" on the edges, and I don't think it was the decorative kind of distressing. I wasn't about to let some sketchy paint chips ruin a piece. We had family coming over for Easter, and I wanted a quick fix...something to make the piece presentable, but also to be able to redo the entire paint job some day. It was completely serendipitous that Q-tips® had offered to sponsor a review here! I got out the only three tools I needed for this job: Q-tips®Precision Tips™, a small paper plate, and some black craft paint. The job was as easy as dabbing a small amount of paint onto the end of the Q-tip and swabbing it onto the mirror in the spotty areas. The precision tip came in handy with a large crack in the corner of the mirror, and there was enough cotton covering the end to paint over a few larger patches without having to hunt down a brush. The rehab took me less than five minutes, and I had a perfectly presentable mirror! I have big plans for this wall, including the paint color...hoping to work on it this summer. But for now, I am pleased to have something to put on a formerly empty wall! This isn't the first time Q-tips have come in handy around here. I actually use them a lot in crafts, and every morning when I do my eye make-up. Inevitably, I get mascara on my eyelids, and the beauty girl told me to wait until it was completely dry before using a Q-tip to quickly wipe it off. Works every time! 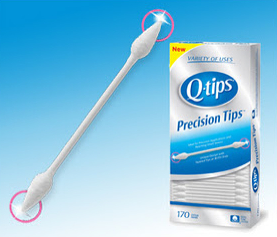 Now that I have these new Q-tips®Precision Tips™ cotton swabs, it will make my morning make-up routine even easier! •Want to make your eyes look larger? @MallyBeauty dabs a little shimmer eye shadow in the inner corners of eyes with Q-tips® Precision Tips™ to cap off the look & make eyes appear larger! •Need to hide under eye circles? Celebrity Makeup Artist @Mally Beauty uses Q-tips® Precision Tips™ to precisely dab on three dots of concealer and blend in for a seamless finish. Voila! •Blemishes are bound to happen! @Mally Beauty knows how to conceal them: Dip one end of Q-tips® Precision Tips™ with an alcohol-free astringent and lightly dab on the blemish. Use the other end to apply an oil-free concealer to keep the blemish hidden! Dirt and dust can accumulate quickly on the moldings and trim of your kitchen cabinets. 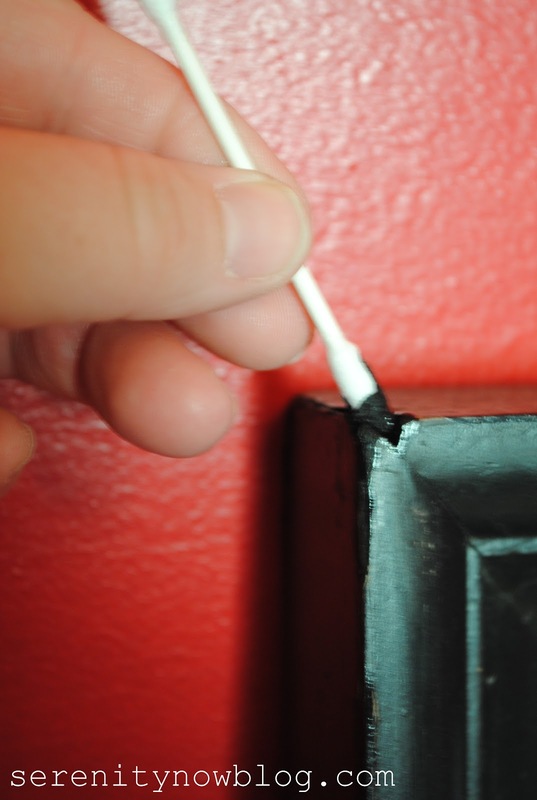 Q-tips® Precision Tips™ cotton swabs are small enough to get into these cracks and crevices and remove unwanted buildup. When you bring out the good silver for a special occasion, Q-tips® Precision Tips™ cotton swabs are ideal for applying polish to the small crevices. Keep your home office in good condition. Use a moist Q-tips® Precision Tips™ cotton swab to clean the edges of the computer screen and between the keys on your keyboard. 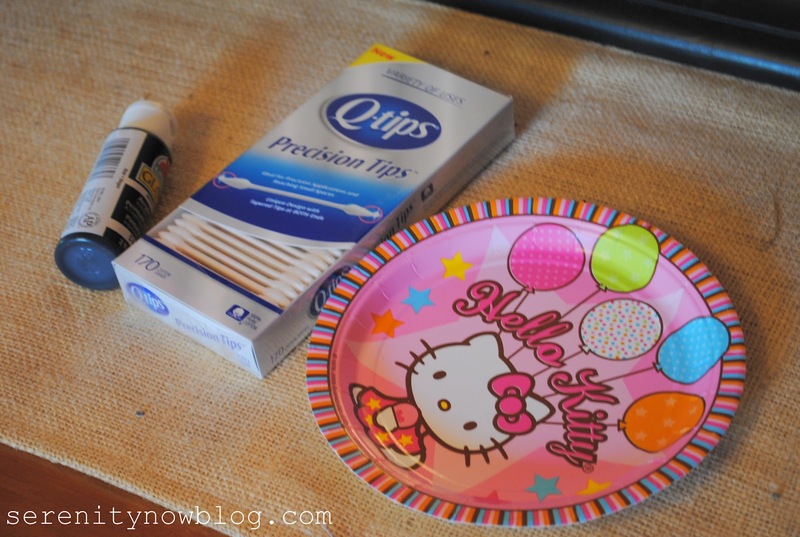 Q-tips® Precision Tips™ cotton swabs are great for applying glue to models and arts and crafts projects. 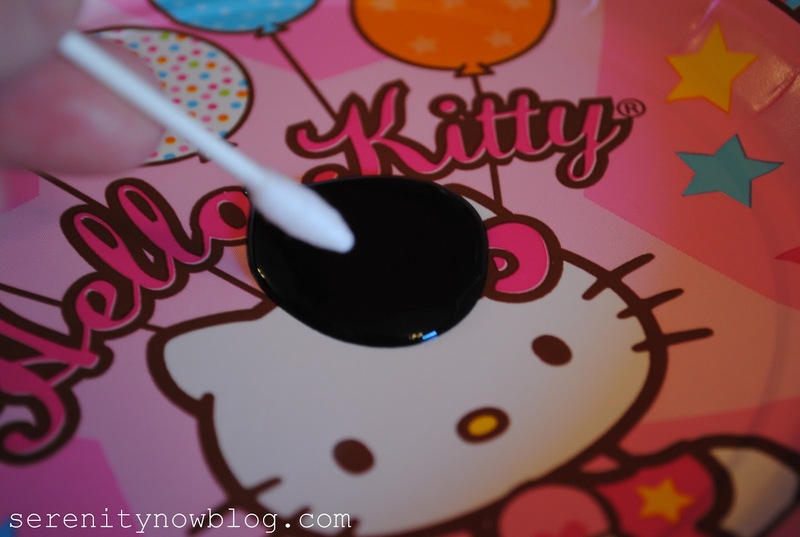 Use one tip to apply the glue and the other to remove any excess before it dries. Carving designs into pottery is made simple with Q-tips® Precision Tips™ cotton swabs. Use them to put the finishing touches on sculptures. Want more tips? You can also follow Q-Tips on Twitter or Facebook for the latest info! Their FB is currently running a coupon for $1 Off any purchase of two boxes Q-tips cotton swabs or Precision Tips, 170 count or higher. Thanks to Q-tips®Precision Tips™ for helping me get my mirror back on track! Come back tomorrow for another delicious dessert recipe! 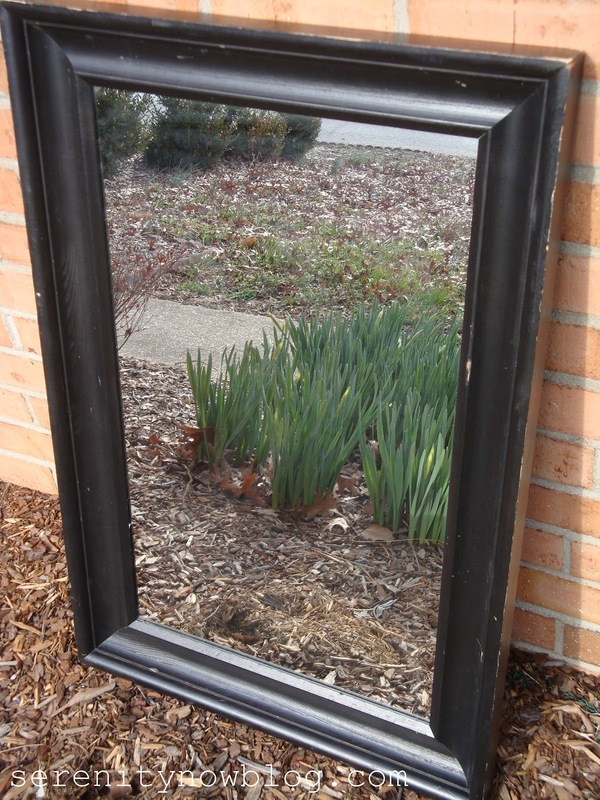 Weren't you lucky to get a new mirror for free once you used your gift card?? It's great that you could refresh it with just a few dabs of paint. I think you are really going to enjoy your refreshed mirror. That was a great find. My husband and I used to go to yardsales every weekend. We should really get back in the habit. There are a lot of great finds to be found when thrifting! It looks great! And I'll bet the person who sold it never imagined it'd end up looking like new. 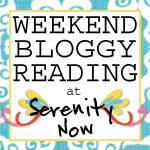 I really love your blog and I tagged you in my post if you are interested in participating. 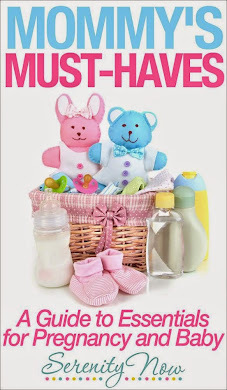 I'm sure you already have tons and tons of followers...I am really new to blogging. Just wanted to show you some love and maybe some more traffic for you! Love your find!! I haven't seen these Q-tips before....gonna go grab me some! Thanks too for all the tips!! So I'm not the only one who paints with Q-tips! I haven't seen the precision tip product; I'll look for it. Great find on your mirror! Isn't it fun to bring something back to life? I love the Qtips with the pointy end for makeup! They work great. love the mirror and i have just the project for precision tip q-tips. they might be just what i need to reach a tight little space. thanks!